While everyone is gearing up for Mobile World Congress 2016, salivating over the thoughts of holding a certain Samsung or LG in their hands, a small Indian company is making waves with the launch of its super affordable smartphone, the Freedom 251. The Freedom 251 is being developed by Noida-based (India) Ringing Bells Pvt. Ltd. Talking about the features, the device sports a 4″ qHD IPS Display with a resolution of 960 x 540. On the inside is a MediaTek 1.3 GHz Quad-Core MT6582 processor. There’s also a commendable 1GB of RAM and 8GB of internal storage with microSD expandability of upto 32GB. There’s also a 3.2 MP rear camera with autofocus, a VGA front camera, a 1450mAh battery and dual-SIM 3G support, so you’re not getting a dumb phone either. The phone runs on Android 5.1 Lollipop, and will come with a bunch of preloaded apps. So, what is the selling point of this device? Why exactly are we stating the specs of a device that sounds like a flagship from 2010, at best? The main talking point of this device is its super cheap price. The device costs INR 251, which translates into $3.67 at the current exchange rates. No, you did not read it wrong, nor did we make any mistakes. The device will indeed cost the final consumer even less than a mere $4. Just Four Dollars! For $4, you can overlook all the specs of the device, and just go ahead and buy it outright. You don’t even need to have a need for the device — buy it first and think of ways to use it later. For $4, if you drop the device and break it, you’d much easily buy another one than spend money and gas to travel to the service center, leave alone get it repaired. For $4… well, you get the drift. So should you or anyone really be buying this device? Before we answer this question, let us get a little more insight on the device and its insane and out-of-the-world price. The parent company, Ringing Bells Pvt. Ltd., is quite an unknown entity even in the Indian smartphone scenario. As an Indian consumer who often encounters unknown smartphones (popularly referred to as “China” phones, which is used as an umbrella term for brands that you will never find a second phone of) when interacting with other people, the company Ringing Bells does not ring any bells (sorry). Livemint.com found out that there’s little known about the company, and that it has Sushma Devi, Rajesh Kumar and Mohit Kumar Goel listed as it Directors in public records. Mohit Kumar Goel holds a few academic degrees, and hails from a family who primarily dealt with agri-products, venturing into telecom only in September 2015. As Livemint quotes, this shift from agriculture to technology was spurred by the “Modi government’s extensive work and obvious commitment to “Sabka Saath, Sabka Vikas”” (roughly translates into “Development for All”). The Freedom 251 was launched by guests Mr. Murli Manohar Joshi, Member of Parliament. The phone was launched under the Make in India banner, being touted as a success story of the Prime Minister of India, Mr. Narendra Modi‘s ‘Make in India‘ scheme. The company also claims that the Freedom 251 smartphone was developed “with immense support” from the government, which was clarified and expanded upon in the launch event, as we will note later in this article. So, how does one create a smartphone that costs lesser than the microSD card that the customer will eventually buy for it? How does one create a product so complex, yet still have a selling price lesser than the charge the customer will pay monthly for 3G Internet? One theory is that the phone could be heavily subsidized by the Government of India. This seems like one of the most plausible theories considering the presence of political heavyweights at the launch event of a phone from a no-name company. There’s certainly a lot of incentive for the government to subsidize such device: a phone at this crazy price becomes affordable to a very large population (and hence, vote bank) of India. Barring the poorest of the poor and those without basic facilities, most low-income groups do possess a ‘dumb phone’ in the family. The cost of this device is competitive against even the ‘dumb phones’, so a phone that can do much more at a lesser price is a logical upgrade for those looking for one. Looking at other initiatives that the Government of India is undertaking, like partnering with Google to install high speed WiFi at railway stations, as well as the Digital India movement, a subsidized phone for the literal masses fits in like that one missing piece in a very elaborate jigsaw puzzle. It’s just too perfect of a scenario to rule out! Another theory is that the phone could be subsidized by a carrier, much like a contract system. Afterall, it is a very common practice in the USA and elsewhere, with phones being sold at fraction of their unlocked price with the condition that the customer has to pay the phone off over a fixed period of time alongside their phone bill. But the current carrier scenario in India has a very small fraction of contracts when it comes to individuals. Most consumers, more so in this specific target demography of cheap devices, prefer a prepaid connection. Contracts are virtually unheard of in this price segment, so a carrier would certainly need to have the vision to undertake such a large risk with such a small profit margin per customer, if at all. Remember, people buying this device are still people that are earning daily wages, so they are unlikely to pay for getting unlimited 3G data when their other, more basic needs are left unfulfilled. Another theory, this coming from the tinfoil-hat-donning skeptic in us, is that when you get products for free, you are the product. The Freedom 251 may not actually represent Freedom, and could be a way to data mine the absolute massive population of India. The rural areas are vast untapped markets when it comes to targeted advertising, so harvesting preferences, location and other personal habits of the users (all “consensual” of course) is a very lucrative proposition. Perhaps the last theory, and the one that just seems too mind boggling, is that the company did actually manage to substantially scale down the costs of the device to the extent that it undercuts even the Chinese. They have managed to climb such a scale of production that they can produce entire smartphones at the selling price of USB Cables. Cheap Android devices exist, and they definitely get cheaper every year. But even with the cheapest of all current hardware, a smartphone is bound to hit $20 based off its manufacturing costs alone. There’s also the question of design and development charges, selling and marketing overheads, advertisements (after all, those front page ads in the leading dailies do cost a lot of money) and even after sales services [Ringing Bells will provide a standard 1-year warranty at over 650 service centers in India]. Factoring all of this, it just is near impossible to launch an actually smart smartphone for less than $4. As such, this theory is the least ranked when it comes to plausibility. So far, no telecom carriers have come forward to announce their partnership with Ringing Bells, so a carrier-based subsidy is off the charts. Government subsidy was ruled out by the company at the launch event. As reported by NDTV Gadgets who were present at the launch event, Ringing Bells President Ashok Chadha confirmed that there is ‘no government subsidy’ for the Freedom 251, outside of a long time friendship with MP Murli Manohar Joshi who provided “vision and guidance” for the project. Since there is no evidence of a proper subsidy, we have to believe the company’s word on this unless proven otherwise… but government guidance/sponsorship is, however, a kind subsidy in itself. Doing the math with the figures the President of the company has given us (which feel overstated, but let’s just roll with it), the cost of the device comes down to INR 300 ($4.4) which is still higher than the selling price. The company charges a nominal price of INR 40 ($0.6) for deliveries, and assuming the company sells all of the smartphones it produced, the project is still seemingly under losses, increasing with every sale of the device and not accounting for after sales services. The company is really banking on the Freedom 251 to get popular in order to actually make money from the project. Like a lot of big companies, Ringing Bells is aiming for the thinnest slice of the biggest pie. Do note that the figures quoted by Ashok Chadha are still controversial as the base price that he started with usually takes into account all the economies of scale — that is why it was so cheap to begin with. Economies of scale are not entirely based off of dividing fixed costs by number of units produced (variable cost); beyond a certain production threshold, you require additional machinery and infrastructure (increasing fixed costs) to produce more units (thereby decreasing them back to the same levels). Companies do hit these limits and to take down these prices even further by small margins takes a lot more cutting corners. Doing so substantially is just wishful thinking, and a remarkable feat if achieved. Nonetheless, the company is confident it can do so. To actually break even and pull in a profit, the company will make its platform available to 3rd parties in exchange of revenue. This model too, is not entirely unheard of. Several big names like Amazon and Google do it, providing a myriad of free or cheap services and even hardware in order to create an ecosystem that is profitable for outsiders to tap. There was no mention of how exactly Ringing Bells plans to “make money from other services”, so all we can hope is that they adopt ethical approaches for these. So, now that we have explained all there is to the Freedom 251, it’s all good right? Should we all jump on the Freedom 251 knowing that everything is clear from here on? Not really. There is still a lot of controversy to the device. Starting off, the product that was listed on the website for the Freedom 251 was not the real product up until recently. An archive of the official website in the early hours of 17th Feb 2016 shows a product with three capacitive buttons, which created a lot of confusion at the launch and after, as the device did not match the images. The device follows along a more iPhone-esque front, so the confusion had legitimate base. The product that the media received at the event not only looked different than what many were expecting, it actually appeared off as a re-branded device rather than one produced by Ringing Bells themselves. While re-branding is not a new strategy, it is very confusing and questionable in this case because the product was already being touted as a success of the Make in India campaign. If Ringing Bells did not make it, then who did? Adcom did. 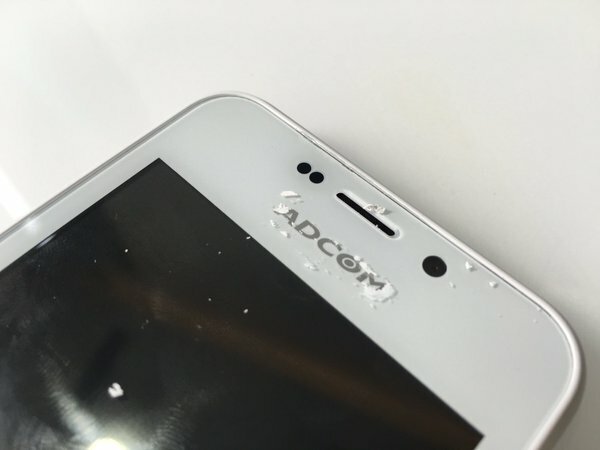 At least the “beta prototype” that the company showed off at the “launch event” was an Adcom product. Adcom is a New Delhi-based importer of IT products. The closest matching product is the Adcom Ikon 4, which is on sale in the Indian market for INR 3,599 ($53). When the team at Hindustan Times got in touch with Adcom, the marketing head denied any knowledge of an Adcom device being used! The white inked front is visible in several media videos. Someone somewhere thought it was a good idea to cover up branding with peel-able white ink, visible even from afar. 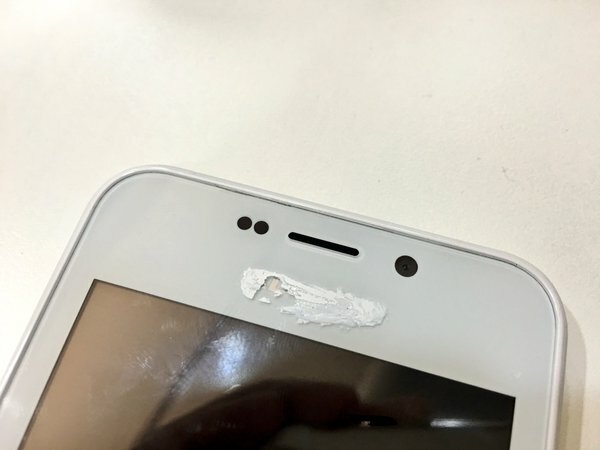 The tricolor sticker on the back is also for allegedly hiding the Adcom branding. We hope that there was some really impeccable use of logic and reasoning behind this that we just can’t grasp, because there is really not much we can come up with to explain such nonsense. The Freedom 251 is also on the edge of a copyright lawsuit as it very clearly copies a lot of the icons from the iPhone. Even the browser icon is that of Safari. 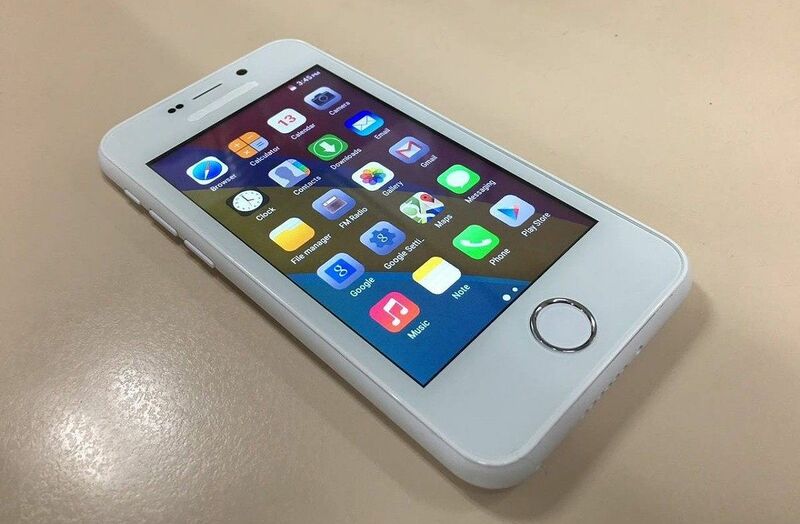 The front layout of the hardware also resembles the iPhone, complete with the round home button. India’s laws and its consequent implementation on copyright are not as strong as those in developed countries. But if the Freedom 251 catches up a lot of market share in the rural areas, we can be sure that Apple would like a bite out of it as well. Oh, and if you can live with all of this, NDTV found out that the Freedom 251 is also not certified by the Bureau of Indian Standards (BIS) as being safe for use in India. This means that the phone does not carry a minimum guarantee of its quality and safety from overheating and fire hazards, amongst others. Getting BIS certification is a costly and time-consuming affair, so the Freedom 251 skipping these does not bode well for the safety of the product, but is consistent with the cut-corners business model. Do note that no other phone from Ringing Bells Pvt. Ltd. or even Adcom for that matter appear on the BIS page, but other notable and popular manufacturers do. This is certainly a serious matter if the device is to make its way into the hands of thousands of people in the country. The Freedom 251 is the people’s phone. It’s a ray of hope for the rural common man, giving him a means to access the vast plethora of knowledge and resources available via the Internet. But there’s just one last catch with the Freedom 251: the poor can’t buy the poor man’s phone. The Freedom 251 went on sale early morning on the 18th of February 2016 at its official website. To purchase the phone, one had to come online at 6AM and add it to their cart, and then make payments via the payment gateway which failed and 404’ed on a lot of users. The payment gateway also allegedly had payment options restricted to credit and debit cards, but we could not confirm this. The site eventually went down for a while due to the unforeseen demand, which the site boasts was to the tune of 600,000 hits per second. As a result, the Director of the company mentioned in an interview that only 30,000 units of the device were actually sold despite the overwhelming demand. Sales for the device are expected to resume again within a day’s time on the website. The company also has promised to deliver all the phones sold in the first batch in 4 months time, by June 30th. Wait, so how does the poor man buy the phone? He doesn’t get to. As mentioned in the launch event, the phone will be sold online-only to cut the marketing and distribution costs. Combined with a small time window of purchase from 18th Feb till 22nd Feb, the downtime experienced by the website and the most important fact that you need to have Internet access in the first place to buy the phone makes it out of reach of the poor. How can one pitch the means of accessing the Internet by selling it on the Internet in the first place? It certainly does not make sense, because in the current state, the only people that would bother purchasing this phone would be the middle class who already have good devices, intending to purchase one as a backup or just because. The company has not mentioned its plan of offline sales, and considering the selling price of the device, it would be no surprise if there is none. Afterall, selling offline through a wide network ensuring that everyone has a means to purchase it would mean more middlemen and an existent profit margin to feed them. To recap, the phone is sold for $3.7. Talking about the phone on XDA would be incomplete if we did not mention its performance. But, performance for the Freedom 251 is a moot point to discuss. For $4, you can use it as an alarm clock and still be satisfied with its performance. But it still is a phone, and an Android at that. As such, it can do all the functions that one expects from a low-end handset. You obviously won’t be able to run the latest Asphalt on it, nor would you be able to take excellent low light images from its camera. But looking at the bang-per-buck ratio as a final consumer, this is arguably the best device you can buy in the market right now (as far as value goes). Ringing Bells Pvt. Ltd.’s Freedom 251 surely has a lot of us talking. Whether you smell a scam in the making, or whether you foresee a future uncovering of a corruption racket caused in the making of the device, or whether you see a visionary entrepreneurial team looking to disrupt the market, we can all agree that the Freedom 251 brought questions aplenty in our minds. We hope the company stands true on the promise of providing the poor man with his phone, opening up his world with opportunities. What do you think about the Freedom 251? Do you look forward to purchasing this device in your country, if at all it arrives? Will the phone spur other manufacturers to a race to the bottom? Let us know your thoughts in the comments below!